Making audible announcements over a PA system is one of the most common and old-school methods of paging available. Your host or hostess will write down the guest’s name and number of people in the party, and when a table is available, he or she will make an audible announcement that brings the guest back up to the host stand. This method typically requires your team to manually keep track of which tables in the facility are available. It generally is not well-suited for noisy establishments as it can be difficult for patrons to hear when their name is called. Restaurant paging devices are rapidly becoming more commonplace, and they are ideal for venues that regularly have wait lists and that have a loud environment. These devices work in different ways, and some feature a very easy to use, automated backend system for your host team to benefit from. Others require your host team to manually trigger an alert to the paging device when a table is ready. Patrons often prefer these devices because they simply have to watch for the device to light up or vibrate to signal their table is ready. Some restaurants are moving to text messaging as a method for restaurant paging. Almost everyone has a cell phone in their pocket, but there may be some patrons who do not. They may not have a cell phone, they may have left it in the car, or their phone may be broken. Therefore, this solution is not always practical. Furthermore, it requires the patron to constantly look at their phone for a text message from your venue. In a loud environment, it can be difficult to hear a cell phone chime. While there are many restaurant paging methods that are in use today, you will need to explore the options to determine which are most cost-effective for your budget. In addition, think about the practicality of the paging system in application for your patrons, and consider the ease of use for your host team. 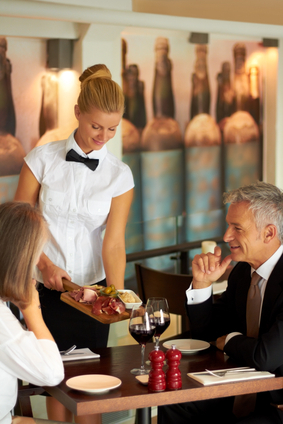 These factors will guide you into make a better decision for your restaurant.